What you can’t see are Annette’s red sequined tennis shoes. come back, experiment, and try to teach ourselves something new. Everything went according to plan. Candace Knapp joined us for a little while, but then she had to go back to work in her studio. We brought home a carload of new stuff from AOE like various acrylic media, new paint colors, and nice big knives for spreading gels. I sprang for a couple more 4-ounce bottles of interference colors and some colors that needed to be replenished. My work is so experimental already that I always learn something new every time I work on a piece. So while they did their own explorations, I worked on more of my boxes that were in various stages of completion, and also did more work on my son’s commission. 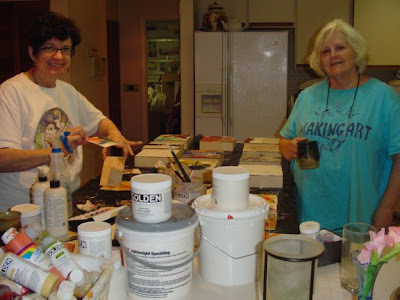 In addition to doing several experiments with textural media and some delicious new colors on some mat board pieces, Linda and Annette painted two of the small boxes and those ended up as door prizes for them to take home. It was a fun and inspiring day. Just what we all needed to get a little kickstart out of the summer blahs. Cath, it’s a veritable wonderland. I love to browse the aisles there! Prices are reasonable, and probably worth it to you even with the shipping. Thanks for the link to AOE’s. I’m sure they will be getting a portion of my $. I enjoy visiting and seeing what you are working on, so I gave you an award today. It’s posted on my blog. Wow, Dierdre, I’m honored! Thank you. Wow….sounds like you guys had a fantastic day. Wish I could have played around with you all.